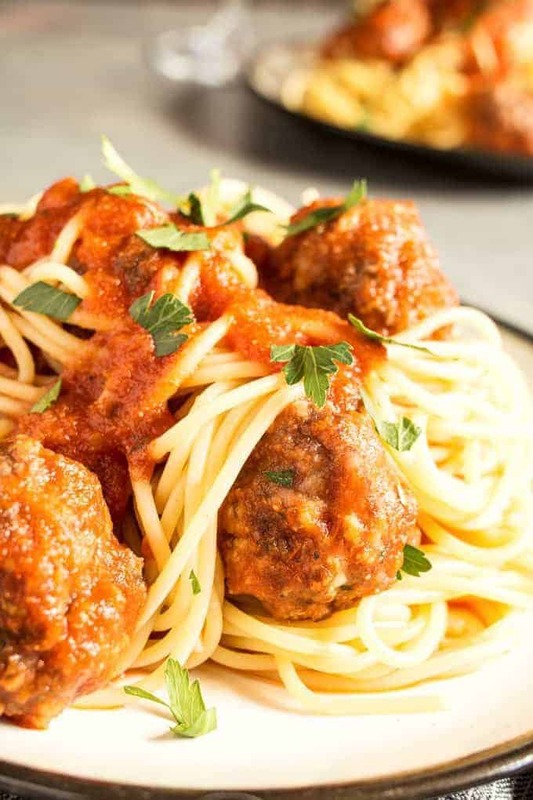 This easy homemade spaghetti and meatballs recipe is perfect for busy weeknights. Prep the meatballs the day before and then pop them in the oven when it’s time for dinner! When I was a kid, my mom made spaghetti a lot. It was easy, cheap and pretty good for those days when you needed to get dinner on the table quickly. My mom worked a lot – her full-time day job and then nights and weekends to take care of my siblings and I.
It’s still a wonder to me how she put in all of those hours, helped us with our homework and somehow had dinner on the table still. 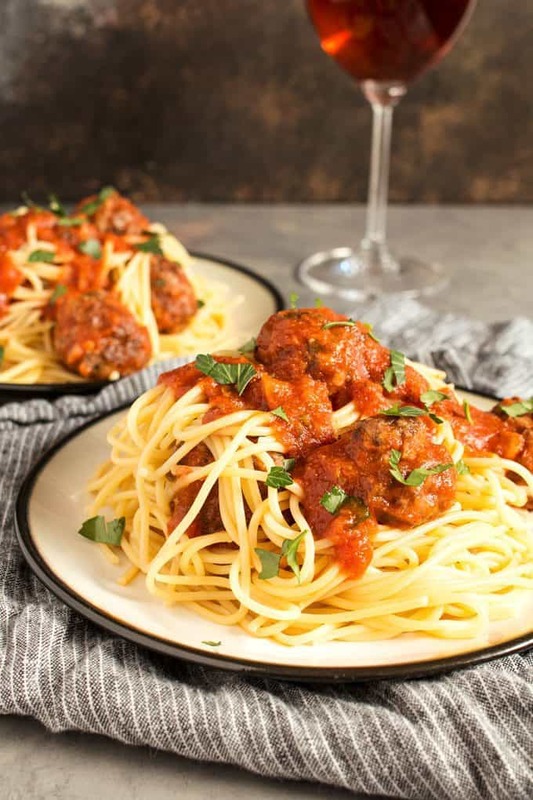 When I started planning my Easy Weeknight Meal Plan for Peapod, I knew I had to include this easy homemade spaghetti and meatballs recipe. It’s just the kind of meal my mom would have made for us and one she would love now. Not that I’m a creative eater now, but I definitely wasn’t then. It was noodles, marinara sauce and maybe a sprinkle of parmesan cheese. Now, I still want to eat spaghetti sometimes but I needed to step it up. This meatball recipe is really easy to make and you’re going to be so happy to make them. You can prep the meatballs the night before and then throw them in the oven when you get home from work. Also, this makes enough meatballs for some serious leftovers. I like to put all of the meatballs in the hot sauce, use half of them with the spaghetti, and save the rest for the next day. Some French bread and some mozzarella slices and you have easy open faced meatball sandwiches. This recipe for easy homemade spaghetti and meatballs is part of a weekly meal plan I created. I’ll be sharing two more recipes from my meal plan this week, or go to FromthePod.com now for the entire plan. 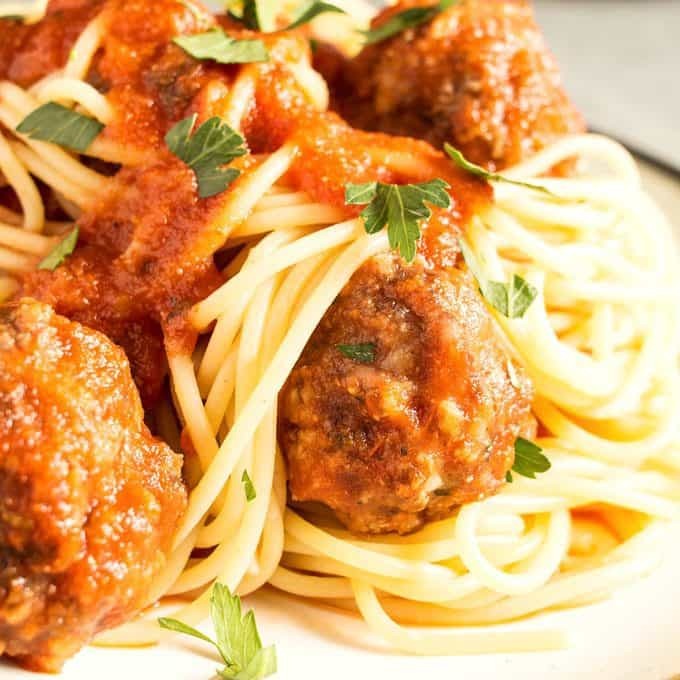 This easy homemade spaghetti and meatballs recipe is perfect for busy weeknights. 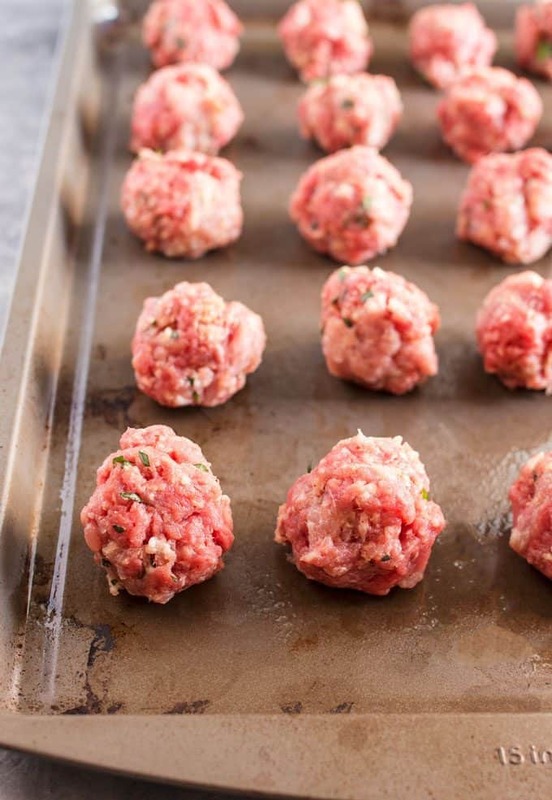 Prep the meatballs the day before and then pop them in the oven when it's time for dinner! Mix together ground beef, ground pork, egg, panko bread crumbs, garlic, parsley, nutmeg, salt and pepper in a large mixing bowl. Bring a large pot of water to boil and cook spaghetti noodles to package directions. Remove from heat and drain, setting aside. Heat pasta sauce in a medium saucepan. When hot, add cooked meatballs and toss in sauce. 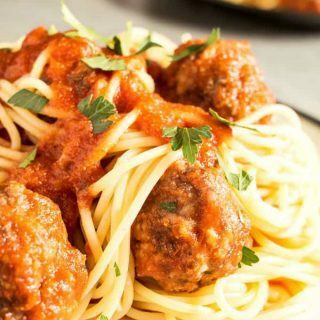 Serve cooked spaghetti noodles with the cooked meatballs. When I cook spaghetti, I always leave big chunks of beef. I haven’t tried making with meatballs, but I am sure I would love the idea. This looks so delicious! Thanks for sharing at Fiesta Friday party! One of our favorite comfort food dinners. Thanks for sharing at the Inspiration Spotlight party @DearCreatives pinned & sharing. Pure comfort food! 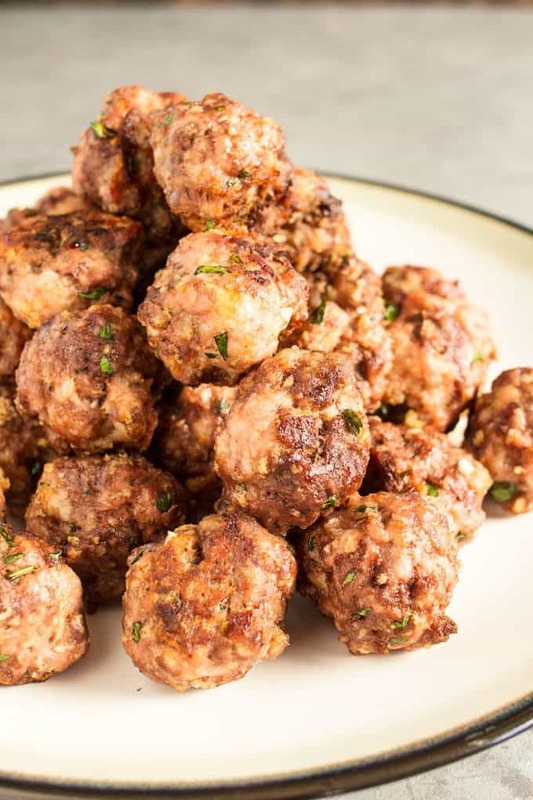 Your meatballs look amazing! Thank you for bringing your delicious spaghetti and meatballs to the party! Happy Fiesta Friday! There is nothing like a nice homemade Spaghetti and Meatballs. Your Meatballs look fabulous! Thanks so much for sharing with us at Full Plate Thursday this week. Hope you are having a great week and come back to see us real soon!